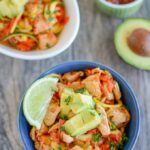 These Mexican Chicken and Veggie Noodle Bowls are so easy and come together in under 20 minutes for a quick, healthy dinner. They’re a fun change from traditional tacos or fajitas. Use a spiralizer to spiralize the pepper and onion (you don’t have to use the whole onion if you don’t want to. Dice the chicken into bite-sized pieces. Add the peppers, onions, chicken, lime juice, paprika and cumin to a dutch oven and saute over medium heat for about 10 minutes, stirring frequently. Meanwhile, spiralize zucchini and summer squash. Cut the veggie noodles to desired length. Add veggie noodles and salsa to the pot and saute another 5 minutes. Taste and add more salsa or seasonings if desired. Ladle into bowls and top as desired. Feel free to use taco seasoning, chili powder or other seasonings instead of paprika and cumin if desired.